Yes it's my third post about Cindy Sherman but this show at MOMA is about to open her landmark show on Feb. 26. with more than 170 photographs some 18 feet tall. 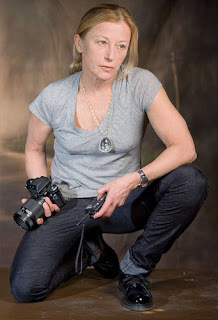 Sherman is the subject of all her photographs where she uses props she has collected to alter herself, complete with wigs, body parts, and full rubber body suits. Sherman is the makeup artist, costumer, and photographer, the creator, the dark and complex characters that maybe we have encountered in other paces other than a museum wall. Read more at the NYT article. The photographer Cindy Sherman in a rare pose as herself.